Check to use a white background for graphs. 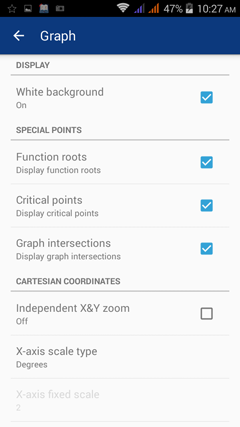 Check to display function roots, critical points and graph intersections while in Graph mode. To turn special points on or off for a particular graph, tap the special points icon beside it (3D or 2D icon - whichever is active). Check the specific special points you want to display or tap "show all" to display all special points. Check to activate horizontal or vertical pinching to zoom in or out of the graph. 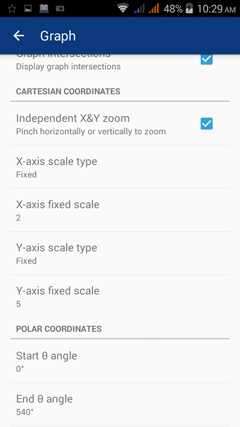 Changes X- or Y-axis scale type. Standard - standard decimal scale. Pinch to zoom in and out or use zoom controls. Degrees - scale in degrees. Useful for trigonometric functions. Radians - scale in multiples of π. Useful for trigonometric functions. Fixed - fixed, non-resizable scale. Use the next setting to set the scale step. 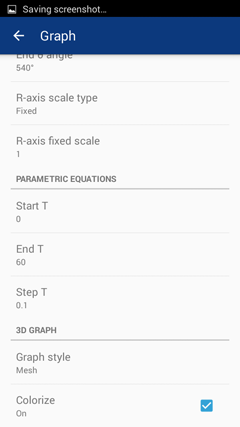 Set the fixed X- or Y-axis scale step size. 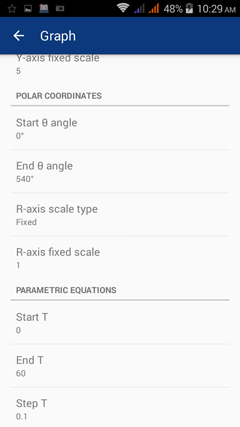 Set the start and end θ angle for graphs in polar coordinates. 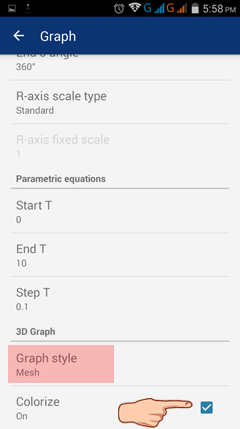 Change the scale type and step for the R-axis. See Cartesian coordinates. Set the default range and step for the T variable. 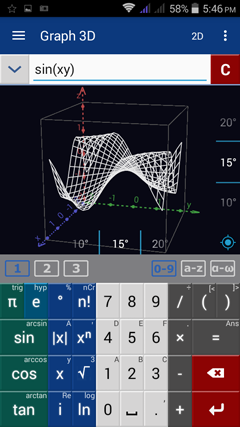 You can change the range and step for individual equations after you enter them in Graph mode. Set the graph style to either mesh or dots. Checking Colorize allows colorization. Turning off colorization yields a graph in black and white. See the sample graph below.